Alishea is a teacher and the Dean of Innovation at Immaculata LaSalle High School in Miami, Florida, an EdTech pioneer, and a Showbie Champion. When asked why I love Showbie, I respond with a myriad of answers. After I explain how Showbie allows me to transform instruction and engage students in the processes of discovery and learning, I share the more personal motivations fostering my deep love for this technology: it prevents me from answering the same questions hundreds of times each year! Showbie helps me redirect the inordinate amount of energy I used to expend on what I consider the minutia of the day – explaining (again and again) directions, announcements, protocols, etc. Like all teachers, I want to focus the time I have with students on helping them realize and develop their cognitive processes — things that inspire — not on the little details of policies and procedures. Here’s where Showbie comes into the picture. I’ve found that by creating a few specific Showbie assignments I’m able to completely redesign my instruction time. Showbie is my main instructional platform and my students do a lot of collaborative group work. With this working dynamic comes several protocols. I could never expect students to remember these protocols, so in each Showbie class I have created an assignment titled ‘Class Protocols’, without a set due date, so students can always access the information. 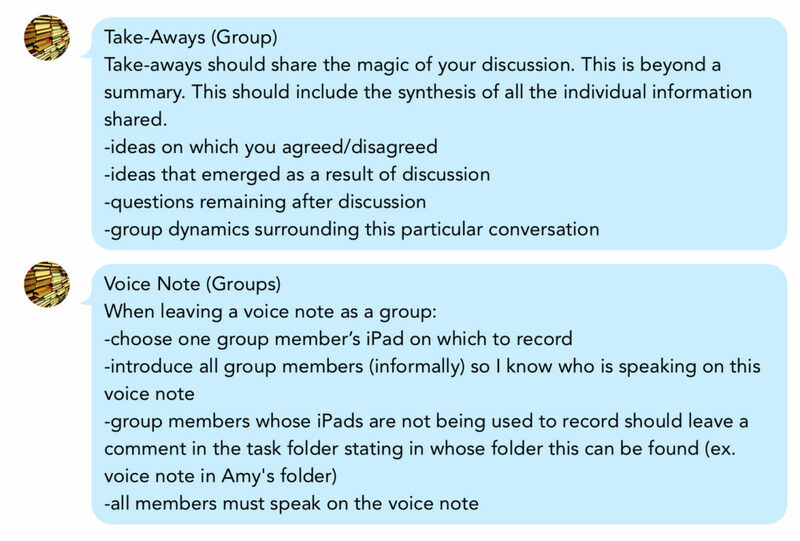 When leaving a voice note as a group, does everyone need to speak? What do you mean by ‘take-away’? Where do we leave voice notes? What do we do if our group isn’t meeting deadlines? How do I ask to go to the bathroom? Can I have a water bottle in class? Can I see you after school? Though we tediously review these protocols with our students at the start of the year and carefully place them in our syllabi, the questions remain. So I include answers to these questions in the ‘Class Protocols’ assignment as well. My students know that if they have a question that begins with ‘How do I…’ or ‘How do we…’, they are to check the protocol assignment first. If I’m asked a question that’s in the protocol assignment, I simply direct them there in a manner that matches both my mood that day and their openness to sarcasm — it could be a witty remark, a simple statement, or a blank stare. Either way, they know to look in the protocol assignment (and, as a bonus, I don’t lose my mind repeating the information). I find Showbie comments the most effective place to list my protocols. The ‘Class Protocols’ assignment results in less of my energy spent on directives and more energy spent on the reason I chose this profession in the first place – cultivating deep and meaningful relationships with students based on critical thinking and creativity.